Perched on the shore of picturesque Mackerel Cove, this cottage enjoys phenomenal sunsets and panoramic views. Slow down and relax, when you’re here you are on ISLAND TIME! Welcome to Maine! You’ll notice things slow down a bit up here, everything from drivers to internet speed. So, sit back, relax, have cocktail, a cup of coffee, enjoy the scenery, do a crossword puzzle whatever floats your boat! We know many of you still need to work while you are on vacation but treat yourself to at least one day of completely “unplugging” from the ol’ world wide web. Lobster will taste sweeter, the sun will shine brighter, and the fish will speak…ok that might be a little bit of stretch but trust us you’ll be glad you did it! Our community LOVES to support local businesses when possible. Swing down to Land’s End Gift Shop and visit Howie, Karen, Ruby, and the rest of the crew you’ll be glad you did. They offer everything from Maine made jams & soaps to lobster hats & t-shirts. There are many local restaurants all with their own specialties, from delicious higher end meals to good old island home cookin’. Read the property listing more than once, prior to booking. Never assume, if you have specific needs or desires please don’t hesitate to ask! We spend countless hours on our website listings making sure they are the most accurate and up to date as possible. Each word, and photo is important in the decision-making process. If you have specific questions that you don’t find answers to in the listing, PLEASE don’t hesitate to call or email! Having a dialogue can help us find you the best home to fit your needs! As Mainers we are a friendly, albeit curious bunch who enjoy meeting folks “from away”. If the opportunity arises introduce yourselves to the neighbors, they can be another helpful source of recommending fun things to do, or places you shouldn’t miss on your trip. Sometimes you are even lucky enough that they are lobstermen and you can buy fresh off the boat! Take a few minutes when you arrive to walk-thru the house & read through the property binder. It is always good to familiarize yourself with the house upon arrival, this gives you a chance to ask any questions you still might have. We have put a property specific binder in each house that should answer any questions you might have from how to run the tv to where to find the outdoor trash cans, and everything in between. Please reference this binder both at the beginning and end of your stay, as there is important information pertinent to your trip. Explore the area beyond your cottage! Visit the area hiking trails, beaches, and landmarks. 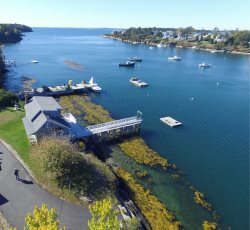 You’ll be surprised at how much history Harpswell and its surrounding towns have to offer. Most importantly make memories and start traditions with your friends and family! Leave us a review! We will send you a link to our online survey just before your departure. Whether your review is good, bad, or indifferent, it helps us to improve our services and we pass along your feedback to the property owners. Please leave the property as you found it. Luckily, we have AWESOME guests, and this is VERY rarely a problem. If you move something, please put it back where you found it. Please be mindful of the “stuff” in the house as many places are generational properties that have many sentimental items, that may not seem important but to the owners they mean a lot. While they may be legal in Maine, we do NOT allow fireworks at any of our properties (with the exception of basic sparklers and morning glories). If we find out that you have fireworks this can be grounds for immediate eviction from the property, which we would hate to do. We know you are eager to get your vacation started! However, there is SO much that goes into getting the houses and cottages ready for you. To ensure that the property is at 100% move in ready we ask that you please respect our check in time of 3pm (unless other arrangements have been made). If by chance your property is ready earlier, we will always give you a courtesy call/text to let you know. If you have been approved to bring a pet you have done the following, signed our pet contract & paid the $50 pet fee (per pet). If you have not done both things your pet has NOT been approved and you should reach out to us ASAP. This doesn’t mean you can’t have a few friends over to entertain. This means that you can’t have an all-out party. If this is something you had been considering doing on your vacation, please air on the side of caution and let us know. We can either say yeah that’s fine at this house, or no let’s try and find some homes that will allow larger gatherings. Landscaping and lawn mowing will continue during your stay, it is important that you DON’T send these kind folks away. They are generally very courteous and come and go as quickly as possible without too much distraction. In the event we need to schedule a repair person we will let you know of this prior to their arrival to the property and will do our best to schedule a time that fits your needs. We ask that you don’t exceed the number of people that the house is listed as “sleeping”. While having a few people over is ok on occasion we expect that doesn’t happen every day of your stay. You might wonder why this is so important? It is because of two reasons, EVERY house or cottage uses private septic systems and having more people than allowed can cause those systems to be over stressed, and that would lead to an unpleasant experience if you run out of water or couldn’t flush a toilet. Also, to ensure that the noise levels & parking limitations don’t get out of control and bother the neighbors.